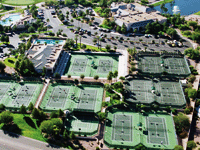 Oakwood Health & Tennis Club/IronOaks Tennis Club - Sun Lakes, Ariz. Adult tennis players 35 and up (or turning 35 in this calendar year), are you looking for a break from the ordinary tennis tournament? If so, then here's your chance to channel your inner Rafael Nadal and test your baseline consistency and patience on a nice, forgiving clay surface at the USTA Southwest Slam Series - Clay Court Championships. 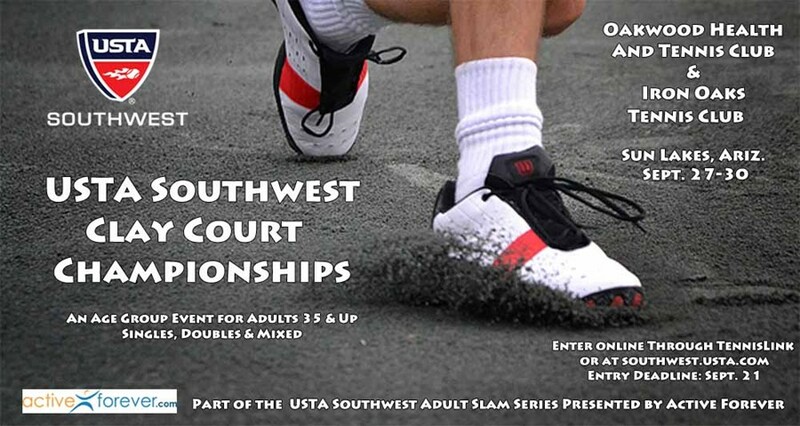 Put your game to the test on the clay courts at the Oakwood Health & Tennis Club (and the auxillary site IronOaks Tennis Club less than a mile away) in this unique USTA Southwest Adult Slam Series event, one of the four "Slams" of the adult tournament year in the Section. The indoor event - held at Shellaberger Tennis Center in Santa Fe, New Mexico in February) - and grass events (held at Desert Highlands in Scottsdale) were both rousing successes this year. We hope to continue in that vein with this event in Sun Lakes, Ariz., and are inviting players to come out and take a stab at this unique surface championship. Get the date of the tournament on your calendar now and sign up! Presented by tournament sponsor ACTIVE FOREVER, this event promises to be a whole lot of fun and a great playing experience! This tournament is a Level 1 Adult Southwest event, and gives the highest ranking points available for a Southwest adult tournament. Check below to see the divisions of play that are available for this tournament. For more info, please contact tournament director John Radcliffe at jdradcliffe@msn.com or (480) 895-0912.